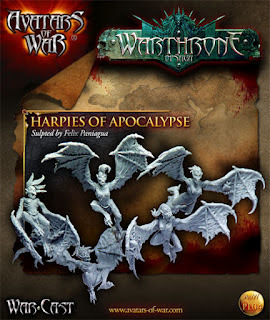 Some of the ugliest models in WHFB are the GW Harpies and Furies. I have always waited for these to be re-done.......and I'm still waiting. Obviously also identifying the need, Avatars of War have released a new boxed set containing 5 "Harpies of the Apocalypse". These are made from resin and come in five separate multi-part poses. Looking at the box art they look a vast improvement on the GW Harpies. I am looking to pick up a couple of boxes to use as Furies in our burgeoning Daemon army. I think that they look as though they will fit this role really well. They are available on AoW website and cost 15.5 Euros per set. They are not on the internet reseller sites as yet but I expect that will happen reasonably soon. These look really nice. I do like the GW harpies myself, mine painted up nicely, but the furies are just embaressing. Old daemnoettes with tyranid gargoyle wings have been my stand ins. I've seen a few images of the new plastic deamonettes with gargoyle wings floating about which look nice, but these look a lot more dynamic. Ooh, one of teh few things I don't have for my daemon army because all the models were crap. Very nice.